Dear Friends, Colleagues, Partners and visitors! One more year is almost complete. One more rich and fruitful season is over. But we are anticipating new times! 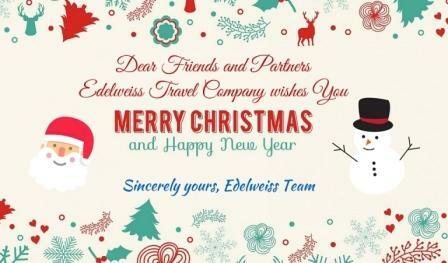 Edelweiss Travel is happy to congratulate you on forthcoming Christmas and New Year holidays. We wish you all the best in 2019. Let New year bring you succes, new ideas, new victories, new aims and new achievements. We would like to thank everyone who stayed with us in 2018 and we are looking forward to see you in 2019 in Kyrgyzstan – one of the the most attractive and interesting destinations in the World!